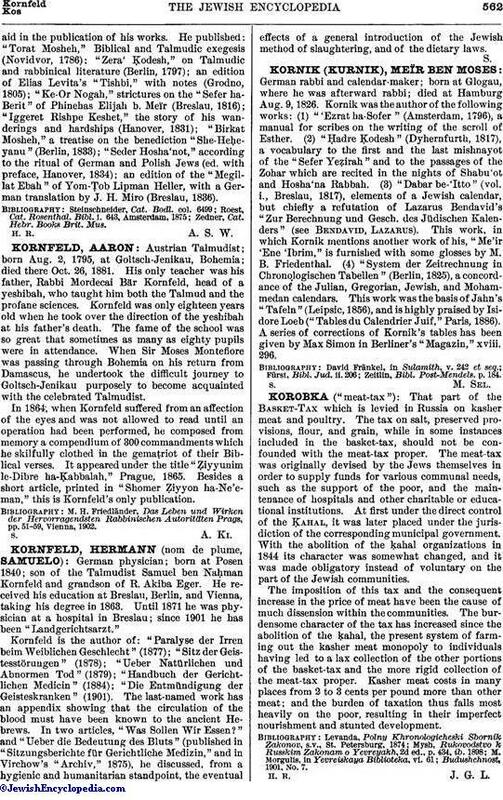 German rabbi and calendar-maker; born at Glogau, where he was afterward rabbi; died at Hamburg Aug. 9, 1826. Kornik was the author of the following works: (1) "'Ezrat ha-Sofer" (Amsterdam, 1796), a manual for scribes on the writing of the scroll of Esther. (2) "Ḥadre Ḳodesh" (Dyhernfurth, 1817), a vocabulary to the first and the last mishnayot of the "Sefer Yeẓirah" and to the passages of the Zohar which are recited in the nights of Shabu'ot and Hosha'na Rabbah. (3) "Dabar be-'Itto" (vol. i., Breslau, 1817), elements of a Jewish calendar, but chiefly a refutation of Lazarus Bendavid's "Zur Berechnung und Gesch. des Jüdischen Kalenders" (see Bendavid, Lazarus). This work, in which Kornik mentions another work of his, "Me'ir 'Ene 'Ibrim," is furnished with some glosses by M. B. Friedenthal. (4) "System der Zeitrechnung in Chronologischen Tabellen" (Berlin, 1825), a concordance of the Julian, Gregorian, Jewish, and Mohammedan calendars. This work was the basis of Jahn's "Tafeln" (Leipsic, 1856), and is highly praised by Isidore Loeb ("Tables du Calendrier Juif," Paris, 1886). A series of corrections of Kornik's tables has been given by Max Simon in Berliner's "Magazin," xviii. 296. Zeitlin, Bibl. Post-Mendels. p. 184.